A monadnock is a stone outcrop that rises out of the surrounding landscape. Monadnocks form as a result of one type of rock – in our case, granite and migmatite – eroding more slowly than its surroundings. This erosion leaves the rock face bare and exposed. Monadnocks are central to the Arabia Mountain National Heritage Area; you can discover more here. It’s just a bare rock, right? Wrong ­– Monadnocks are host to a variety of wildlife and some vibrant ecosystems. Lichen is one of the primary successors in this ecosystem, meaning that it is one of the first organisms to grow on and break down the rock face. The growth of the lichen and small amounts of erosion result in solution pits and vernal pools. Solution pits are small impressions on the rock face filled with soil; these periodically fill with water to create vernal – or ephemeral – pools. The entire monadnock ecosystem relies on solution pits for life. In the solution pits’ shallow sandy soil and the vernal pools’ water live a variety of plants and animals, from the vibrant red diamorpha flowers to the federally threatened pool sprite and the endangered black-spored quillwort. Ongoing efforts to protect these species and support their natural habitat are a part of the work of Arabia Mountain rangers. Frogs and salamanders make use of the vernal pools as well; tadpoles and larvae grow in the spring and summer and amphibians rely on the vernal pools for refuge from the summer heat. Ultimately, the solution pits can become rich enough that larger plants such as cactus and trees can grow there as well. These habitats are beautiful but also fragile, so please exercise caution and avoid stepping in vernal pools and solution pits when hiking. Wow! But how did human history affect these monadnocks? All three monadnocks (Arabia, Panola and Stone Mountains) were affected in slightly different ways by human activity. Stone and Arabia Mountains were both quarried during the 19th and 20th centuries. Arabia Mountain granite, a mixture of granite and gneiss called “migmatite,” proved especially useful for construction. As a result, Arabia Mountain granite was sent all over the world and used to build structures such as the US Naval Academy in Annapolis, MD and the Brooklyn Bridge in New York City. As you walk through Davidson-Arabia Mountain Nature Preserve, you’ll see the remains of the quarry operations that took place there. In fact, it was the Davidson family that owned the quarry and who donated the land to DeKalb County to create today’s greenspace. Panola Mountain has a different story. 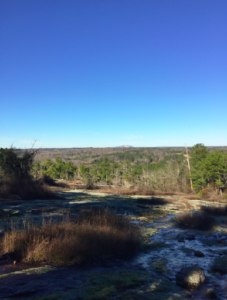 With a slightly different geological composition than Arabia and Stone Mountain granite, Panola was never quarried on and industrial scale and today, Panola Mountain State Park carefully preserves this pristine monadnock ecosystem. The conservation area is only accessible with a guide from the State Park. That’s another great reason to take part in the hikes during Monadnock Madness! This sounds great! How can I participate? Monadnock Madness tickets go on sale January 22nd at 10am. Take a look through our events and decide what you want to do – we’ve got several dozen events occurring throughout the month. Sign up for one of our signature Triple Hike Challenges to summit all three mountains in one day. Prefer to go it alone? Complete the Triple Hike Challenge via the “Hike as you Like” option. There are two opportunities to take the Wildlife Photography Workshop – March 2nd and March 17th. Join master nature photographer Larry Winslett in a small, personal class to learn tips and tricks for great wildlife photography. Larry has chronicled the natural world across North America and brings a keen eye to capturing the landscapes of Georgia’s monadnocks. If you’re a shutterbug, don’t miss this event. Practice monadnock mindfulness – come join Mountaintop Yoga! 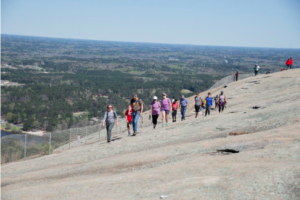 Join Sandra of Bakari Yoga on a short hike followed by yoga on top of Arabia Mountain. You will leave more grounded, aware of your surroundings, and better connected to the natural world. That’s just a smattering of the events we have in store for this March. Check out our full events calendar here. This March, the monadnocks are calling. Come explore Georgia’s granite giants!